Stanley Hasty, Professor Emeritus of Clarinet at the Eastman School of Music, died Wednesday, June 22. He was 91 years old. One of the most highly regarded and successful clarinetists and teachers of his time, Professor Hasty held the position of principal clarinet in six major orchestras and served on the faculty of several of the nation’s top music schools. Many of his students went on to hold significant positions in orchestras and music institutions across the country. He taught at the Eastman School of Music from 1955 until his retirement in 1985. In May 2010, many of Professor Hasty’s former students from the Eastman School returned to Rochester to celebrate his 90th birthday. 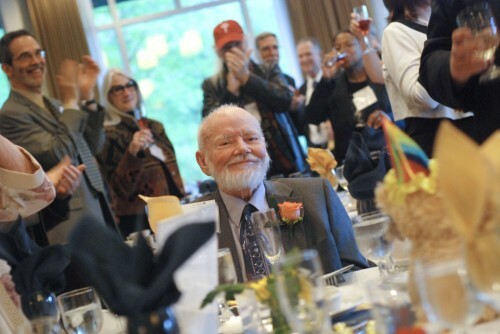 During ClarinetFest 2010 held in July in Austin, Tex., a lecture and concert in his honor were presented by former students. Born Feb. 21, 1920, in McCook, Neb., to a musical family, Professor Hasty started playing clarinet in ninth grade. He received his Bachelor of Music degree at the Eastman School of Music in 1941. Between 1943 and 1955, he served as the principal clarinetist and soloist for the National Symphony Orchestra, the Indianapolis Symphony Orchestra, The Cleveland Orchestra, the Baltimore Symphony Orchestra, and the Pittsburgh Symphony Orchestra. During those years, he also taught at Indiana University in Bloomington and at the Peabody Conservatory of Music in Baltimore. In 1955, Professor Hasty joined the Eastman School faculty and the Rochester Philharmonic Orchestra, where he served as principal clarinetist until 1970. In addition to Eastman, he also taught at the Cleveland Institute of Music, the Juilliard School, and the New England Conservatory of Music during that time. Respected as an eminent teacher, Professor Hasty received the Eastman School of Music’s Eisenhart Award for Excellence in Teaching in 1978. He also received the University of Rochester’s Mentor Award in 1984 for his outstanding contributions as a distinguished scholar and outstanding teacher. The Eastman School is the first professional school of the University of Rochester. To celebrate Professor Hasty’s 25 years of teaching at Eastman, the School presented the “Hasty Festival” in 1980. The four-day event featured seminars, master classes and concerts. After his retirement from Eastman in 1985, Professor Hasty continued to travel throughout the United States and Canada as a recitalist, lecturer, clinician, and adjudicator. The long list of Professor Hasty’s former students also includes such people as Kenneth Grant, principal clarinet and the Robert J. Strasenburgh Chair of the Rochester Philharmonic Orchestra; Larry Combs, principal clarinet of the Chicago Symphony Orchestra from 1978 to 2008 and currently a faculty member of DePaul University’s School of Music; and the late Peter Hadcock, assistant principal and E-flat clarinetist of the Boston Symphony Orchestra. Professor Hasty is survived by his wife June; his daughters Jill Wilkerson and Jaqi Hasty (Walter Berger); his son Douglas Hasty; grandchildren Ariel and Tristan Berger and Schuyler and Carlin Hasty; and his brother-in-law Eugene (Diane) Mugrage. He was predeceased by his daughter Daryn Hasty. A memorial service for Professor Hasty will be held on Saturday, Aug. 6, at 11 a.m. in St. Paul’s Episcopal Church, 25 Westminster Road at East Avenue in Rochester. In lieu of flowers, donations can be made to the Saint Paul’s David Craighead Organ Restoration Fund.